Bank Nifty bounced by more than 9000 points in last 1 year (From 26-Dec-2016 to till date) and bounce is steep and sharp without any reasonable correction. And it has been 7 months I had prepared my last analysis report on all time frames, so this weekend I decided to look at all time frames again to conclude future possibilities. This is monthly time bar chart of Bank Nifty covering life time move of Bank Nifty from low 3314. And within wave (3), it seems inner waves (i), (ii), (iii), (iv) are completed and wave (v) may be progress from 13407. Within wave (v) of (3), it seems wave  may be completed at 20575, wave  may be completed at 17606 and wave  may be in progress from 17606. Other Possibility : Or may be it is just inner wave (i) of bigger wave (3) completed at 20907, (ii) completed at 13407 and (iii) in progress. This monthly chart can help in suggesting trend for larger time frames but is not going to help in calculating any confident upside levels for short/medium term trade. So, we need to analyze the progress of very last upside wave  started from 13407 separately on lowest possible time frame to calculate further levels. This is Daily time bar chart of Bank Nifty Covering move from low 17606 which is the start of wave  of wave (v) of (3) on monthly chart. From low 17606, it seems wave [i],[ii],[iii] may completed till 25198, wave [iv] may be completed at 23611 and wave [v] may be in progress from 23611. Minimum 38%-61% projection for wave [v] is placed at 26511-28302 which is the possible range on upside for completion for wave [v] if wave [iv] is already completed at 23611. Wave [v] still needs to minimum 26511 to meet its minimum requirement. 38% retracement of progress of wave  is placed at 22297 which can be referred as long term breakeven point or reversal point. Now, we need to analyze the progress of wave [v] of  started from 23611 on separate lowest possible time frame chart to check its pattern. It seems wave (1) completed from 23611-24460, (2) completed from 24460-23916 as Irregular Correction, (3) completed from 23916-25953, (4) completed from 25953-24617 as Simple Zigzag and wave (5) may be in progress from 24617. Minimum 38% projection for wave (5) is already achieved and next 61% projection is placed at 26064 but top of wave (3) is 25953. So, 25953-26064 is minimum target range for wave (5) to complete. Note: Wave (4) retraced deeper than 61% and also overlapped with Irregular wave (2). So, may be the pattern I am showing is wrong but I am not able to identify any other pattern. So, I am going with the same pattern as of now and will notify in case of any change. And with wave (5), it seems wave 1,2, 3 may be completed till 25780, wave 4 may be completed at 25232 as Complex Correction (double zigzag) and wave 5 may be in progress from 25232. 38%-61% projection for wave 5 is placed at 25676-25950 but end of wave 3 is 25780. So, 25780-25950 is the minimum target range for wave 5 to complete. Now, we need to analyze the progress of wave 4 and 5 started from low 25232 on separate lowest possible time frame chart to check its pattern. 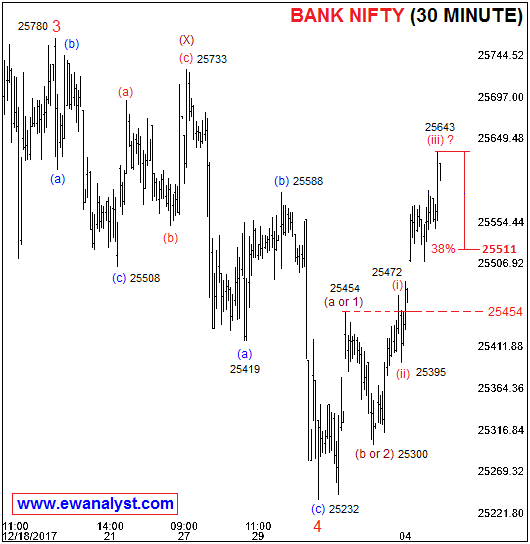 This is 30 Minute time bar chart of Bank Nifty covering move from 25780 in which I marked as start of wave 4 on previous chart. 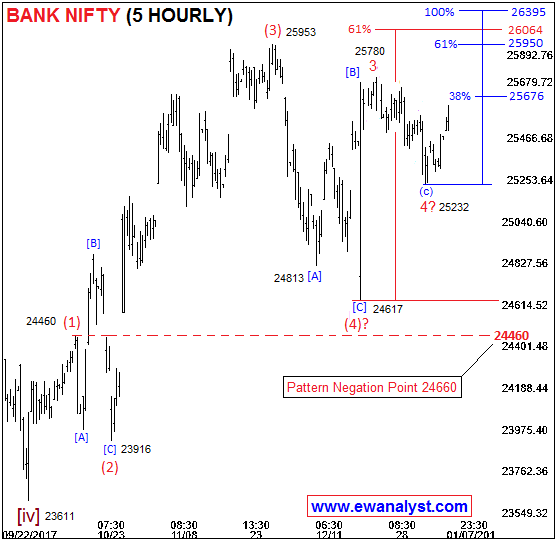 It seems wave 4 completed from 25780-25232 as Double Zigzag correction and wave 5 may be in progress from 25232. And within wave 5, again the pattern is not clear but generally it seems wave completed from 25232-25454 may be wave (a or 1), wave completed from 25454-25300 may be wave (b or 2) and wave (c or 3) may be in progress from 25300. 38% retracement of the progress of wave (c or 3) [started from 25300-25643] is placed at 25511 which can be referred as breakeven point and same can be used as stoploss for any longs. For Long Term : Bank Nifty is in bullish trend and has long way to go but there can be some occasional corrections in between which can be used as good buying opportunities. 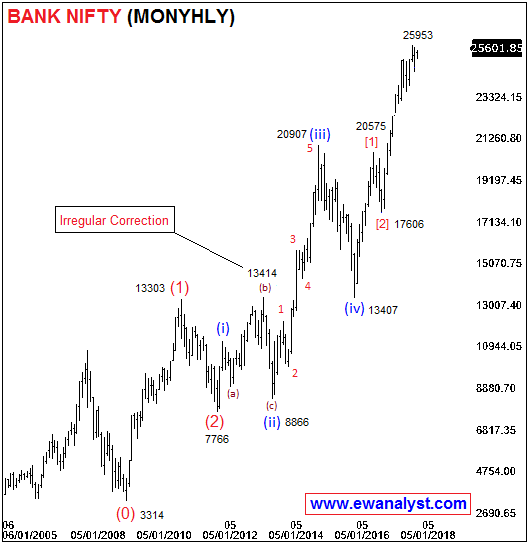 And the same indicates that there is good investing scope in banking stocks for longs term, specially the stock in the wave (2) or at the start of wave (3) on larger time frames. For Medium Term : Bank Nifty needs to touch 26511 at least to meet its minimum requirement and 22297 is the breakeven point on downside. So, if Bank Nifty happens to decline towards 22500-22000 without touching 26511 then it will be a great opportunity to buy for the gain of 4000-5000 points. 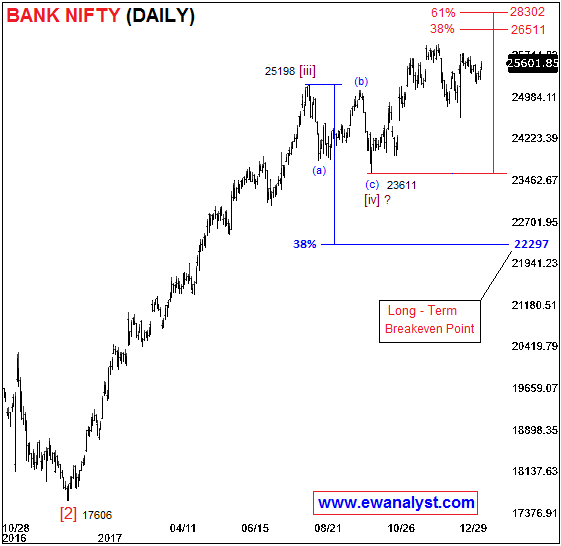 For Short Term : Bank Nifty still has possibility to touch 25780 which further can extend towards 25953-26064 and 25511 is the immediate breakeven point on downside and same can be used as stoploss for longs. For Long and Medium term : We can plan trade only when there is opportunity and we need to wait for that. I had explained the conditions and possibilities in conclusion. For Short Term : Those who are holding longs (Futures or Calls) can hold the same with exact stoploss of 25499 (below 25511). Minimum upside target is 25780 which further can extend towards 25953-26064. Exit the trade and wait for next opportunity if stoploss triggers.